Description (from NASA): Turquoise, deep green, light blue, and bright sapphire blue colors combine in the waters surrounding the Bahamas to stand out against the deeper blue of the Atlantic Ocean. Because the 700 islands and islets sit on an underwater plateaus, the waters of the Bahamas are very shallow, ranging from barely covering the ocean floor to 25 meters in depth. In this true-color Terra MODIS image, the Great Bahama Bank is clearly visible at image center curling around the central islands, Nassau (right of Andros), Eleuthera (right of Andros), Cat Island (southeast of Eleuthera), Rum Cay (middle right edge), Long Island (south of Rum Cay), and Great Exuna (west of Long Island). 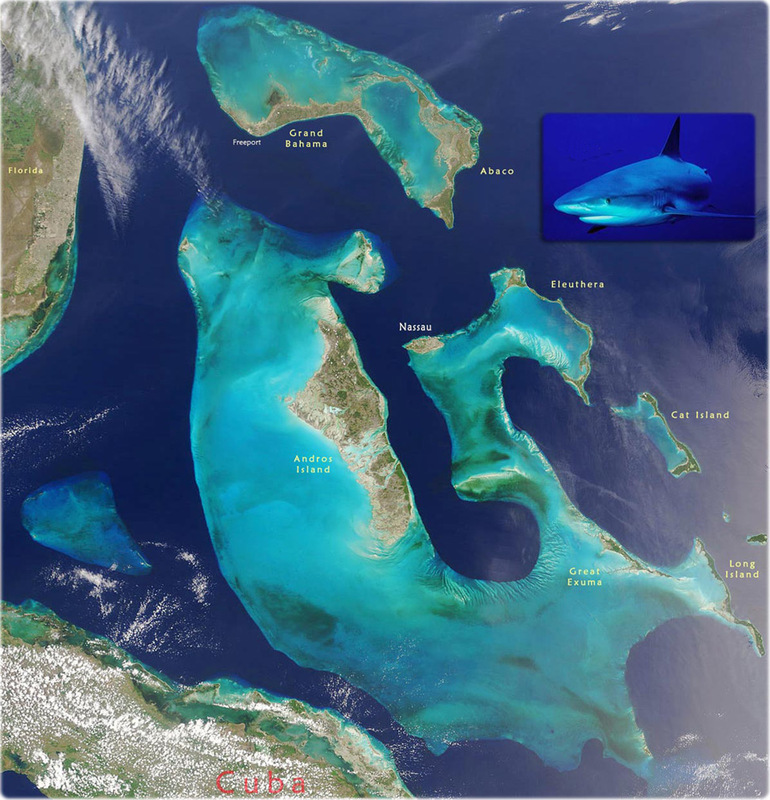 In the upper part of the image, the islands of Great Abaco (left) and Grand Bahama (right) sit on the Little Bahama Bank. West of the Great Bahama Bank is the smaller, triangular Cay Sal Bank, upon which a number of small islands sit. This image was acquired on May 18, 2001. Copyright © Geographic Guide - Great Exuma, Long Island, Eleuthera and Nassau, capital of the country. 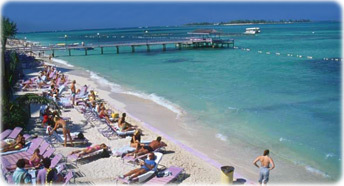 Beach in Nassau, The Bahamas. Caribbean reef shark, New Providence Island.